Mohamed Morei, 18, has been held since 4 January. The scene of January's stabbing. A SOLICITOR REPRESENTING a youth accused of murdering a Japanese man in a stabbing in Dundalk has told a court he has serious concerns about his client’s fitness to plead. 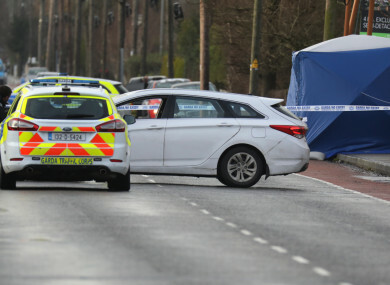 Mohamed Morei, 18, has been held since 4 January after being charged with the murder of 24-year-old Yosuke Sasaki on the previous day at the Long Avenue, in Dundalk, Co. Louth. He was unable to attend 11 subsequent hearings at Cloverhill District Court. The accused had been receiving ongoing medical care in the Central Mental Hospital in Dundrum in Dublin and was unfit to attend court on those occasions with doctors’ notes being furnished stating he was continuing to get treatment. In June he appeared in court and five additional charges were put to him. He appeared again at Cloverhill District Court last month and faced another hearing there on Thursday when Judge Alan Mitchell was told the book of evidence was ready. However, it was not in court to be served on Mr Morei who listened to the proceedings with the help of an Arabic interpreter. Defence solicitor Barry Callan asked for a four-week adjournment to be granted for a psychiatric report on his client to be completed. He said he had concerns at Mr Morei’s fitness to plead and he required the report. He also had concerns at his client’s capacity to give instructions, he told the court. Judge Mitchell said he did not have jurisdiction over the case and that issue would have to be considered by the Central Criminal Court. He said he did not want to unnecessarily delay the accused being returned for trial to the Central Criminal Court. Any other matters that come to light can be raised later, he said. He refused to accede to the defence application for a four-week adjournment and further remanded the accused in custody for another week. Mr Morei dressed in a tracksuit did not address the court during the hearing on Thursday. The judge further remanded him in custody to appear again at Cloverhill District Court on August 22 to be served with the book of evidence and returned for trial. In addition to murder he has five other charges: assault causing harm to two named men at the Inner Relief Road and on Quay Street, in Dundalk on 3 January criminal damage to a car rear window at the Long Avenue, on the same date as well another for trespassing with intent to cause criminal damage at a property there between 2 and 3 January; the final charge was for obstruction of gardai at Dundalk station on 3 January, 2018. In June, Garda Damien Welby told the court the accused replied “I don’t remember any of this” when the trespass charge was put to him and he said “I don’t remember anything” in response to the criminal charge. The Director of Public Prosecutions (DPP) has directed that Mr Morei is to face trial on indictment in the Central Criminal Court on all charges. The DPP has also directed that he can be sent forward to that court “for sentence on a signed plea should that arise”. However, yesterday/today (thur) a query was raised by a State solicitor about whether that was permissible in a murder case. Mr Sasaki, from Ebina, west of Tokyo, was fatally stabbed on The Long Avenue shortly before 9am on 3 January last. Following his death, an Irish man was injured when he was stabbed a short time later at a nearby location. At 9.40am, gardai received a report that another local man had been injured in an attack. Email “Solicitor has concerns over Dundalk stabbing accused's fitness to plead”. Feedback on “Solicitor has concerns over Dundalk stabbing accused's fitness to plead”.